At ADIO Health Chiropractic you will be treated like family from the moment you walk in. We have created an open, fun and family friendly environment for you and your children to enjoy and relax in. To make your first visit as seamless as possible, we provide our Intake Forms online, so you can complete your paperwork in the comfort of your own home…simply fill them out, print when completed and bring it all with you to your appointment. On your first visit a member of our team will review your health history and then take you through a complete consultation. One of our doctors will then do a neurological and postural assessment followed by a thorough examination of your spine and nervous system. Throughout this process, we will educate on various aspects of what we do and why we do it related to the importance of spinal biomechanics and the health of your nervous system. We utilize the INSiGHT Millennium (surface thermography) technology for kids and take digital x-rays, if needed, for adults. We will also cover what your health goals are. 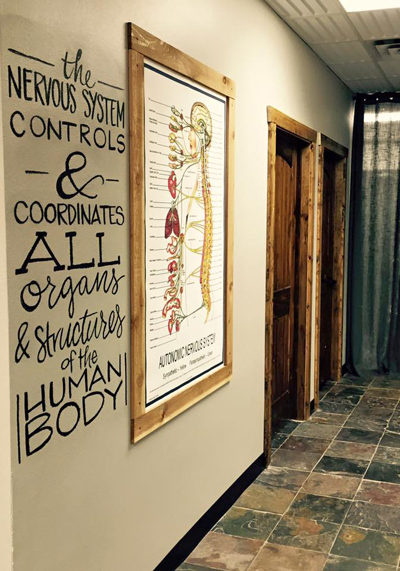 We take pride in providing a significant amount of education in our office because the more you know about how your body functions, the more passionate you can become about how chiropractic can help. Please allow 45-60 minutes for your first visit. All of our care plans are created to meet your individual specific needs. We use subjective and objective measures to ensure that you are receiving the exact care that you need based upon the findings from your initial assessment and evaluation, INSiGHT scan and/or digital X-rays. Our focus is always on long term correction versus short term quick fix care. Regardless of the past or your current health concerns, there is always hope. We have created a culture within our office that allows our practice members the ability to dream again! Too many people let their health concerns get in the way of the things they really want to be doing with their life. We are genuinely invested in your health and are interested in learning how we can best support you on that journey. We want to help you reach your goals and will celebrate along the way as you reach each one! We utilize state-of-the-art technology to not only find the root cause of your health concerns, but to correct them at their source. The INSiGHT technology is used to detect hidden patterns of stress and tension, shed light on internal changes in the body, establish a baseline and identify potential problem areas. This technology helps us determine the most effective path when caring for each patient and gives us the most comprehensive look at how your master control system, the nervous system, is functioning. Not only are we able to determine exactly how we can help you with this technology, we can accurately measure your progress along the way while receiving care in our office. It is the ideal tool for pediatric and family-focused wellness care. If necessary, Dr. Mike’s team may perform specific digital X-rays, including motion study films, for most adult patients to look at the structure of the spinal column, assess for bio-mechanical deviations and spinal degeneration and any other underlying issues that need to be addressed. The X-rays give us an in-depth and real time look at the structure and condition of your spine. When you return for your second visit, Dr. Mike will have already reviewed your health history, goals, and analyzed your nerve scan and/or X-rays. He will discuss his full recommendations for starting care and answer any questions you may have. At this point if you’re ready, you will begin care with your first specific and scientific Chiropractic adjustment. As a new patient you will be given a patient ID that is used to check in on the iPad at the front desk. After checking in you will go back and begin the spinal correction exercises assigned to help prepare your spine for an adjustment. These exercises are designed to meet your specific needs. Allow 15-20 minutes for regular visits. Give your family a solid foundation for health. Contact us and see how chiropractic can help you live better today!